Spring is in full swing in Michigan greenhouses. Growers are busy receiving young plants and shipping others to markets that have opened due to the recent warm weather. Recruiting and maintaining sufficient labor remains a major challenge in the greenhouse industry as the unemployment rate in Michigan is around 4 percent. More greenhouses than ever are using the H2A guest worker program, while others are considering the program in the future. In visiting with growers through the winter months, the Michigan State University Extension floriculture team has seen growers using a variety of strategies from high-tech equipment to streamlining their product lines for greater efficiency. Here are some of the strategies that growers are using to reduce labor costs at their facilities. A common practice among the greenhouse industry is to germinate seedlings and root vegetative cuttings in plug or liner trays. This production practice maximizes greenhouse space and increases efficiency. However, many greenhouse operations are opting to reduce the number of times that each plug (seedling), rooted cutting (liner) or container is handled thereby reducing labor costs. Therefore, growers have started to direct unrooted or callused cuttings into their final containers. In contrast to many European plant growers, American ornamental plant growers are expected to produce hundreds (or even thousands) of species or cultivars so that they can become a one-stop shop for a plant retailer. While most growers in Michigan are still producing many plant species and cultivars, they have streamlined their efficiency by limiting the types, styles or sizes of containers. 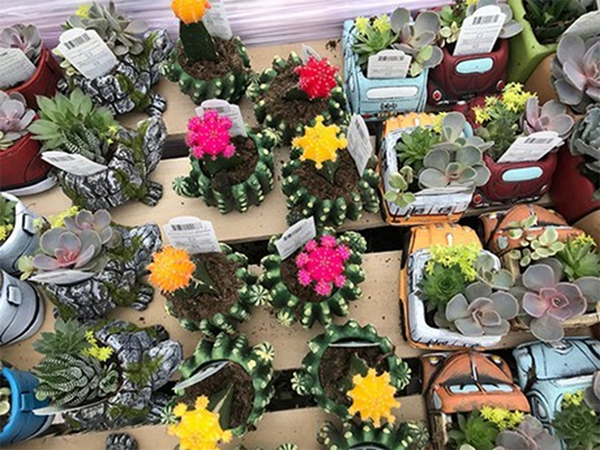 One Michigan grower who markets their plants in elaborate, decorative pottery or other unique containers has streamlined production by growing succulents in all 4-inch pots, which will be directly placed into the decorative container prior to shipment. Therefore, the high-value container is less likely to become damaged or show signs of wear and tear during production and it increases the efficiency. Greenhouse growers who produce larger combination planters or bowls have started implementing place-holder containers. This allows growers to produce plants that have different environmental and cultural requirements or schedules in separate containers outside of the combination planter and then transplanted into the final combination planter as needed. For instance, growers plant the outer plants, e.g., “fillers and spillers” then place an empty container in the center for the “thriller” thereby reducing labor when transplanting the central plant. When the central plants arrive, which may be a tropical foliage plant produced outside Michigan or are finished in the other growing conditions, the growers remove the place-holding container and transplant the center plants. Greenhouse growers use plant growth regulators to chemically pinch plants. Spraying, drenching or sprenching reduces the need for hand pinching plants. Pinching off the apical meristem increases lateral branching and therefore enhancing the overall quality of the plants. Conveyor belts are used especially during sticking of unrooted vegetative cutting, transplanting of plugs or liners or during times to streamline plant material out into the growing areas, thus increasing the efficiency of production. Growers have also implemented conveyor belts in some facilities and ease the movement throughout the facility and reduce the number of staff needed to complete a task. Boom irrigation reduces the number of employees needed to hand water plants. Growers can also apply various chemicals through irrigation booms to reduce the amount of single applications. Boom irrigation systems are best used in facilities where plants are grown on the floor with wide ranges and walkways. Producers who grow large quantities of young plants have made the investments into robotic vegetative cutting sticking machines, such as the Visser Autostix system (Photo 10). The vegetative cuttings are placed into biodegradable clips (Photo 11) which helps improve the performance of the robotic transplanter and allows for it to process some of our more delicate cuttings species. The sticking machine reduces the number of employees needed on the sticking line and reduces the time to stick cuttings. Some growers invested in automated transplanters to transplant plugs from trays into larger containers. This robotic system also reduces labor needed on the transplanting line. Producers who grow large quantities of young plants, especially perennials or woody ornamentals, use grading or sorting machines. Especially in longer production cycles, perennials and woody ornamentals differ in growth rates or quality throughout the production period. Those selling young plants often need to grade those for shipment or replant those that need more production time. Growers of woody ornamentals needed to prune, shear or trim plants in order to increase rooting and control extension growth during long production schedules. This custom-made trimming machine (Photos 14, 15) allows for employees to trim plants quickly while disposing of the growing tips along the aisles which can easily be cleaned up. Michigan State University Extension recommends growers take note of processes that decrease efficiency or require heavy staffing during this season. Once the season is over, greenhouse owners or managers can seek to input labor-saving strategies for next year.